Some days I wake up and I just feel like there is so much to do. Which sometimes only overwhelms me and deters me from getting anything done at all! A couple months ago, I decided to make a valid effort to organize my daily and weekly routine. To help me, I made a checklist to keep above my desk. Trust me, it didn’t magically work overnight but I am making great strides to making this routine work. Some areas could use extra work and attention but progress makes perfect. I’ll briefly explain my (pretty obvious) checklist. I organized chores for each day and some chores I do on a daily basis like vacuuming the rug and sweeping the floors. The daily fitness area sometimes intertwine with the fitness bracket so I don’t over exert my muscles. 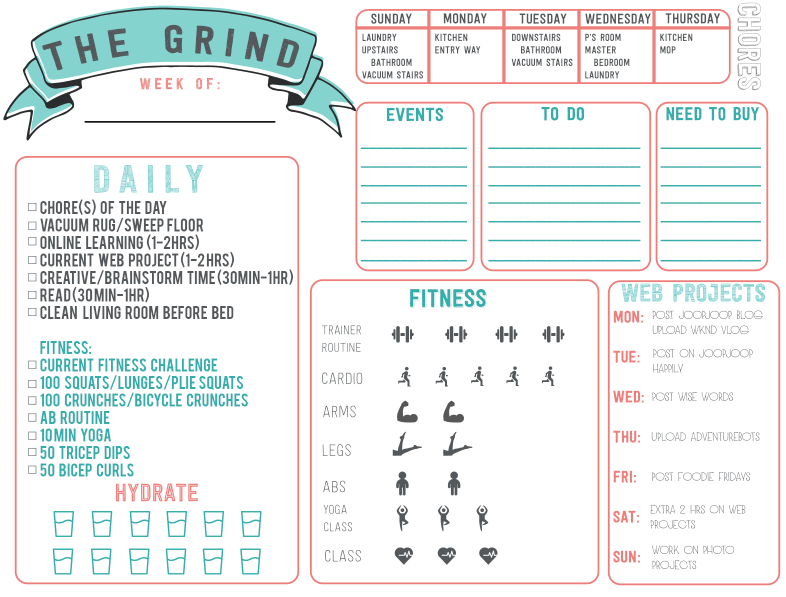 The fitness bracket is just how many days/times I want to do a certain muscle group or class. I find this bracket the easiest to knock out, surprisingly. The most important part of my checklist is the “hydrate” section. I am TERRIBLE at remembering to drink water. This has helped me SO much. It feels good to cross off a glass, as ridiculous as that sounds. I struggle the most with my web project section. I’ve been swamped with sessions and other projects that I haven’t been diligent about staying on schedule. I am working towards mastering that column!